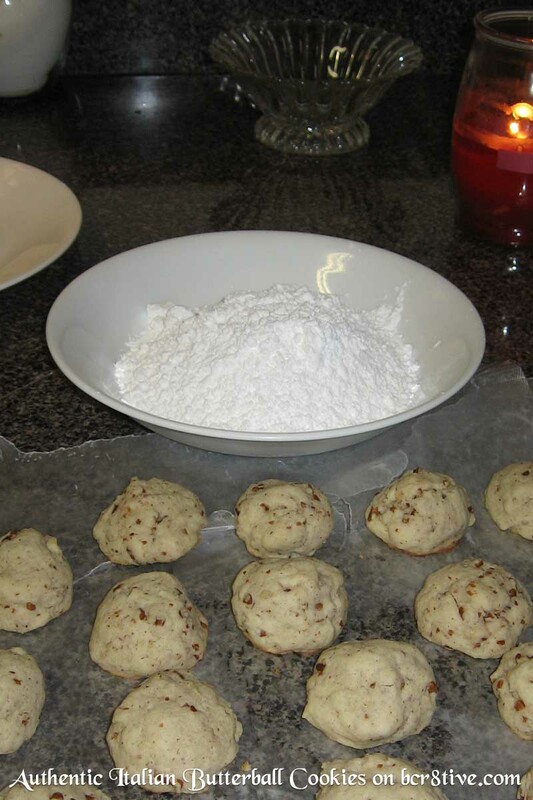 This is my personal recipe for Italian Butterball Cookies. 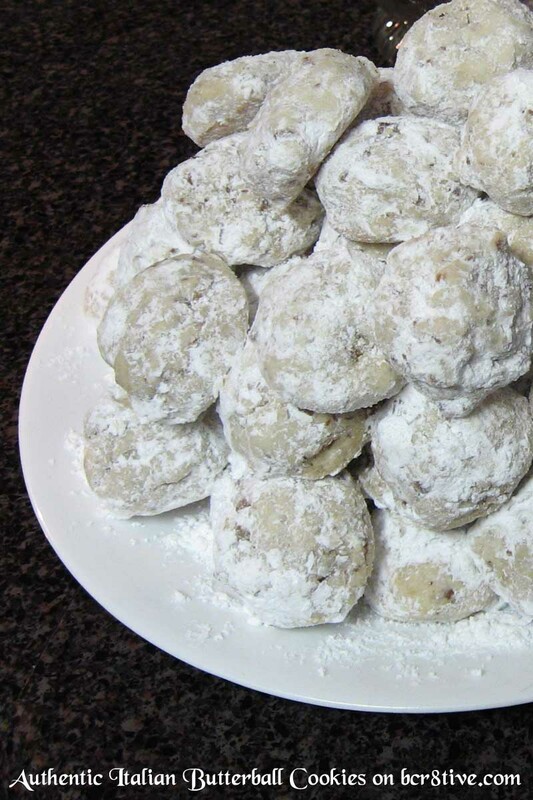 Similar cookie recipes to these are referred to as Mexican Wedding Cakes, Southern Pecan Butterballs or Russian Teacakes, but I’ve browsed the web to see if anyone else makes this recipe this way and they do not. They always seem to be lacking an essential ingredient or using an ingredient that I wouldn’t. I try to cook with fresh ingredients and predominantly from scratch when I can. 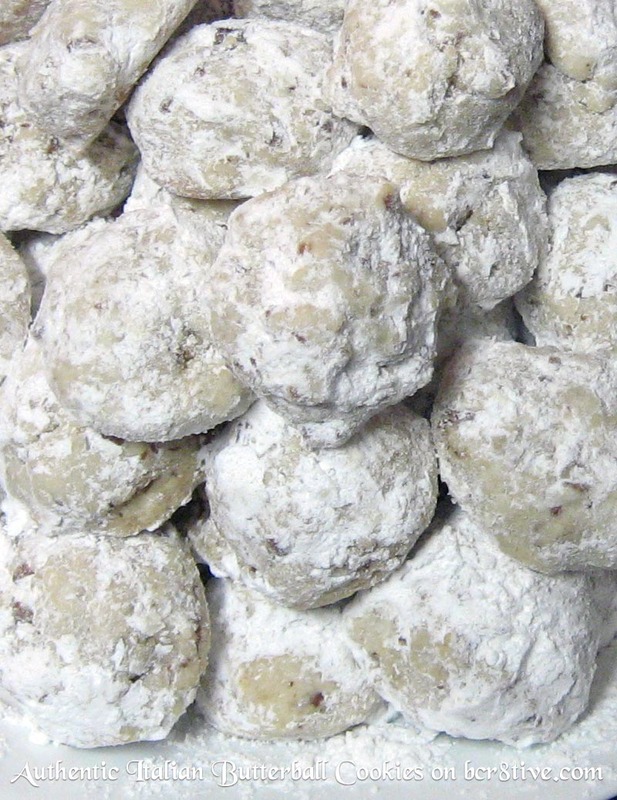 In my opinion, the chopped pecans are what make these cookies melt in your mouth delicious, as well as the combination of vanilla and almond extracts. I have to admit, I almost hesitated to post this recipe since it’s my personal special for the holidays and I’m a little territorial about them, but then, sharing is caring and it’s nice to think that perhaps you’ll be nibbling on yours and think of me – and suddenly yell Thank You for telling me how to make these RIGHT bcr8tive!! These cookies are so good, you could certainly make them anytime you want a treat but they’re perfect for the holidays and make a pretty gift too. 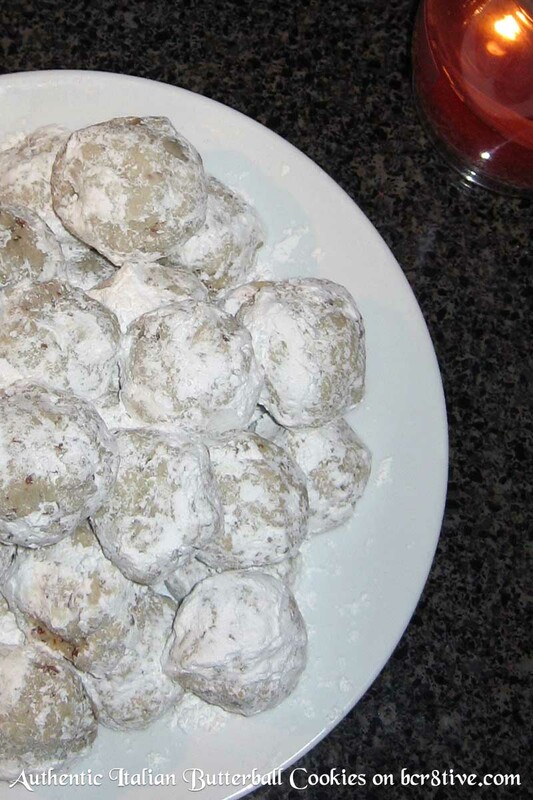 They look a little bit like snowballs but they’re much more tasty. The fact that they’re a ‘white’ cookie also makes them an attractive choice for a wedding cookie too. They’re just finger licking good. The last few times I’ve made them, I packed them up for gifts into large food containers but you could certainly be more creative than that and line a gift box with a colorful napkin, store them in holiday decorated food containers or cookie tins. You can wrap them in cellophane or decorative party favor cookie bags and finish them off with a colorful bow tie or you could even fill mason jars or upcycled candle jars with them. I save those… the hoarder in me always thinks I’ll find a use for them and I’m thinking of using some for Salt Caramel this year. Grind the nuts and set aside. Bake in the preheated oven until firm, about 10 minutes. Spread the 1/4 cup confectioners sugar in a shallow bowl. 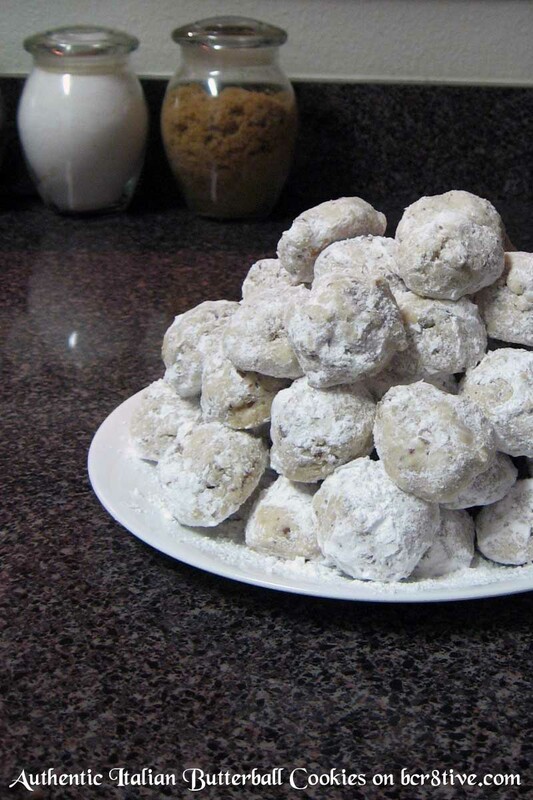 Roll the cooled cookies in the confectioners sugar to coat. Place them on the wax paper until you’re ready to package. Check out the newest addition to bcr8tive’s Creative Cookie Recipes – Lemon Ricotta Cookies with Blueberries and Lemon Icing – they’re delicious! 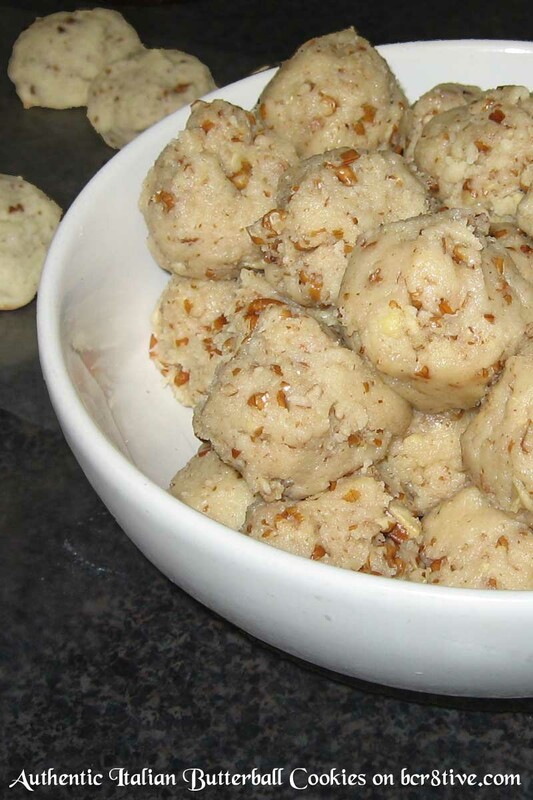 4 Responses to "Authentic Italian Butterball Cookies"
These were so good!! Thank you! Delicious! Loved them. Thanks, I’ll be back! Hi my name is Samantha and I just wanted to let you know, I’ve tried many different butterball recipes and you are right! This one is DELICIOUS! I made it for a party and everyone raved about how good the cookies were. Thank you so much for posting it.